You can search by customer email, customer phone number or the phone number the customer has called. You can also send information from Dixa to Podio with the contact form integration. Uses the user's email as Podio lookup and returns the matched data. Uses the caller's phone number as Podio lookup and returns the matched data. Uses the called phone number as Podio lookup and returns the matched data. 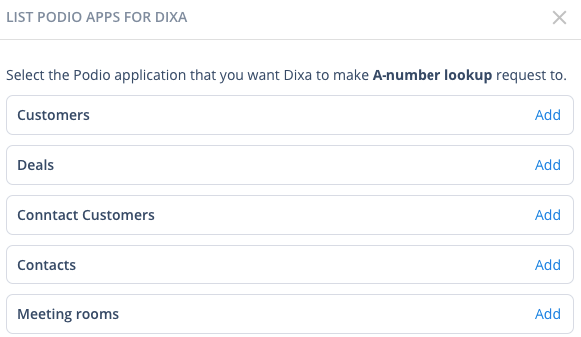 Enter "dixa" in Application Name. Enter "podio.dixa.io" in Full Domain. Click on Generate API Key. In Dixa go to Settings - Integrations and click on Podio. Enter the Client ID and the Client Secret from Podio. Click to confirm in Podio. Authorize the integration in Podio. You can now select what information in Podio you want to show in the converstation view in Dixa. Generate an API key in Podio. Enter the Client ID and Client Secret from Podio into Dixa. A-email look up. uses the user email as Podio lookup and returns the matched data. A-number look up, uses the caller's phone number as Podio lookup and returns the matched data. B-number look up, uses the called number as Podio lookup and returns the matched data. 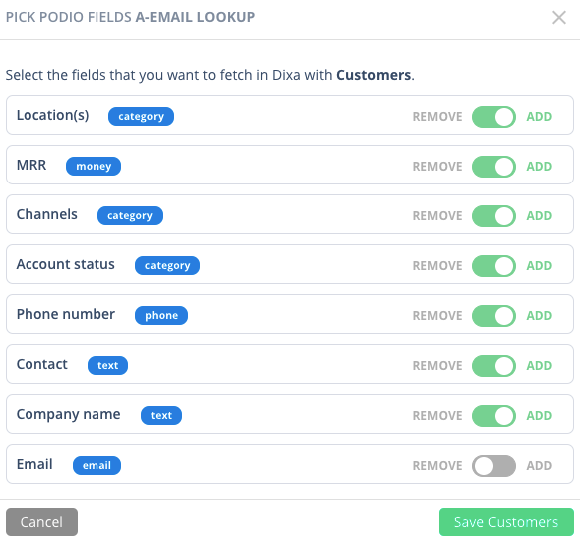 The Contact Form integration allows agents to send data from Dixa to Podio.